My time spent in two major Indian cities has been packed full of sensations and feelings that have overwhelmed me at times. Now that I’m back in Chennai I feel more comfortable because it is familiar to me and we are away from the Golkonda Hotel’s awful hallway music. 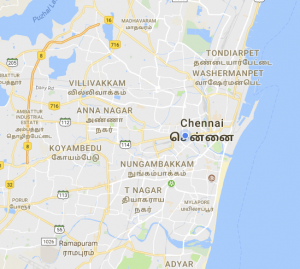 After getting out into the city to do research with Hyderabad Urban Labs (HUL) and spending time in Chennai, I’ve noticed a few things about urban Chennai and Hyderabad. 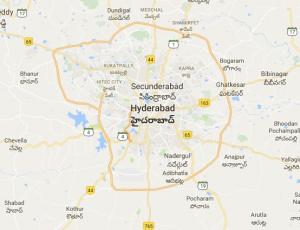 Hyderabad has a circular main road that surrounds the center of the city. The standard city block is packed with various stores – shoes, chai, cellphones, pharmaceuticals, and biryani might all be sold in the same complex. We gained more insight into Hyderabad’s urban layout after learning from HUL’s staff during our transect through the city. Dr. Anant Maringanti explained to us how the city is split up into areas based on when that area was developed (new/old city, old/new, new/new, old/old). Even though there were the same Indian shops on every other block, some areas in Hyderabad were specialized based on historic development or depending on who lived there. Muslim communities in various parts of the old/new part of the city specialize in metalworking while some communities on edge of the city focused on automotive repair. We passed shops full of metal pots and pans in the inner city and then passed huge trucks being scrapped, repaired, or used for parts on the edge of Hyderabad. I haven’t noticed compartmentalization of communities like that in Chennai yet. 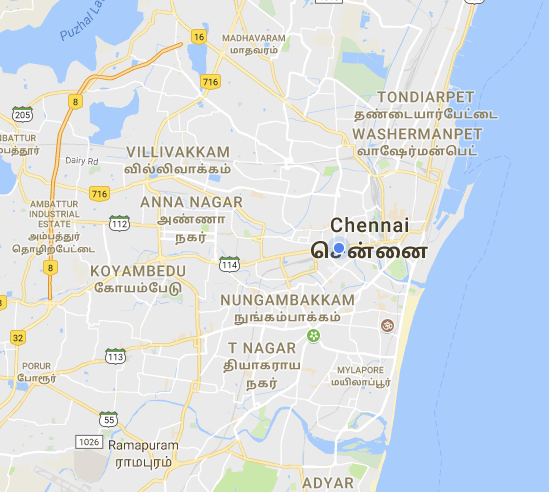 Chennai is a coastal city with roads that extend away from the shore. 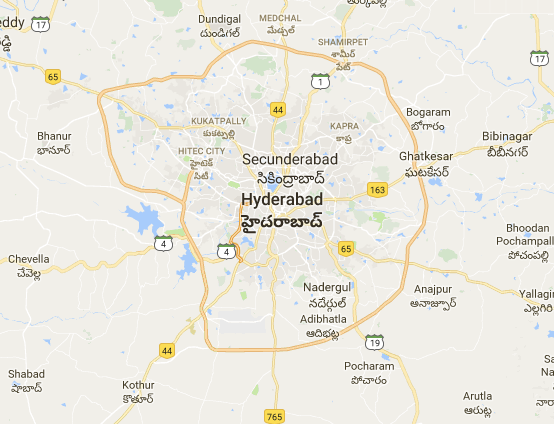 Hyderabad’s layout is composed of concentric major roads that circle around the city while Chennai has roads that move out from the center of the city and follow the coastline. My experience with traffic is similar in both cities – while I am now comfortable traversing traffic and getting rides from people with questionable driving skills, I am still sensitive to the high levels of automotive emissions that are mostly coming from the autorickshaws. Being an urban pedestrian is a huge part of my Indian experience that was never a noticeable aspect of my American life. My pedestrian experience in Hyderabad was somewhat uncomfortable for me because of the auto emissions on the major road we took to get to HUL/HILA as well as having to spend so much time collecting data on some of the main roads and neighborhoods. I felt insecure when we were collecting data in the streets of Hyderabad because many of the people around us were very poor and we are like white, well-off tourists that had the privilege of spending time collecting data for personal use. It was almost like a section from Jamaica Kincaid’s The Tourist where she describes how tourism is almost a form of neocolonialism. Her piece focuses on the condescending thoughts and privileged perspective of a tourist who has no reason to be in a foreign country other than for their relaxation and entertainment. My experience wasn’t that similar to The Tourist, but I found myself asking what the heck I was doing in a foreign country and whether I had any business taking notes on peoples’ lives. Ultimately, it was a good experience because I learned to become comfortable walking on a busy road, going into congested neighborhoods, and came to understand neighborhood life in Hyderabad a little better than before. Having an HUL staff member with us helped bridge language and culture barriers that were problematic on the first day of our field studies. With their help, we got to talk to shop owners, street vendors, and even a general hospital representative about relevant public health topics in Hyderabad. We figured out that small general and specialty clinics run by individuals are how most people get health care in India, compared to the US where most get primary/specialty care from doctors who are employed by large hospitals. Although it was an uncomfortable experience for me to be on the polluted, low air quality streets taking notes on public health, it has given me insight into the perspective of urban Hyderabad workers and poor folk – something that I was shielded from as I was sitting in the AC of the bus during the urban transect. My urban American experience is limited. I’m from Gainesville, FL which is a college town (University of Florida) with a population of about 125,000 people. Davidson College, where I go to school, is in the small town of Davidson which has a population of around 10,000 people. Those are small numbers compared to Chennai and Hyderabad (8.5 and 6 million people respectively, according to our lecturer Dr. L. Venkatachalam) which are the two biggest cities I’ve ever visited in my life. Although I live in Gainesville, I really live on the most southwestern suburban part that is closer to the countryside than the central city. There is space between houses, relatively few people, open fields, and no major highway within a few miles of my neighborhood. Gainesville and the surrounding countryside is a grid. Most of the roads run straight for miles because it is so flat, there is no need to go around hills or valleys, making it really easy to learn the layout of the city. It makes riding my bike a bit boring because there is no geographic diversity. Davidson is slightly hilly and doesn’t have a grid structure, which makes riding my bike more interesting. I spend a good amount of my time riding through the rolling hills of the countryside, quietly alone or with a few friends. I can’t imagine doing the same in Chennai or Hyderabad! Gainesville, FL has some beautiful country roads that I love to ride on with the local cycling club. My experience in India has not only been a cultural shock but an urban one too – the noises, smells, and feelings that come from a densely-packed street are not things I am used to. Whether my aversion to the big city will pass or not is to be determined, but I think I know for certain that I am a sucker for the outdoors. Perhaps my discomfort is due to the cultural differences, language barriers, and feeling of homesickness, but I will soon find out how comfortable I am once we go to the Andaman Islands and the Western Ghats – two biodiversity hotspots that I’ve looked forward to going to since August.